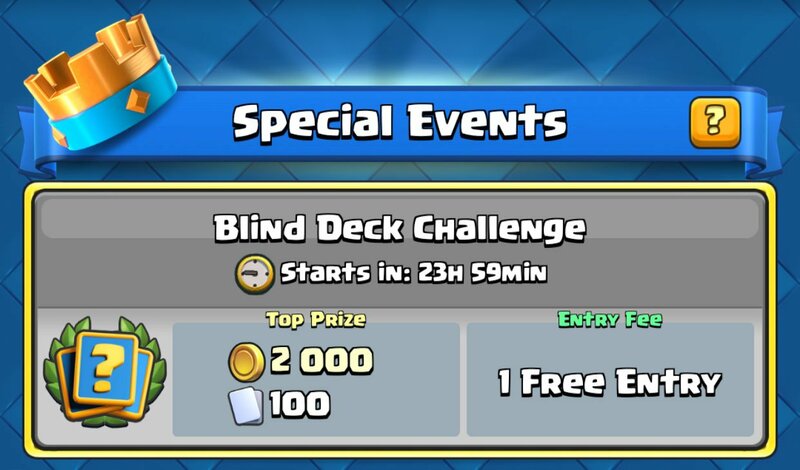 A new special event will be starting in Clash Royale tomorrow, the blind deck challenge! From the name, I hope that it means completely random decks, instead of only 6 decks that the king’s cup had. As with all special events, the challenge will be free for the first entry and then cost 5 gems to enter every time you play in it again. Again, it is unclear what decks will be used, but hopefully it is an infinite number of random decks! Thanks for reading and make sure to play a couple challenges with the blink deck challenge in Clash Royale! Thanks for reading and I will see you guys soon! Am I really that good? My level 3 account is now in arena 5, and I still have only 3 losses and 2 draws total. That’s actually pretty good. I’m in arena 8 with more than 500 three crown wins. Pingback: Clash Royale Blind Deck Challenge Starts Tomorrow | Clash of Clans Guide, Strategies, Tricks and More! I am now in arena 4 on my level 3 account, and I have only ever lost 2 battles, and drew 1. The deck I used: Giant, valk, musketeer, fireball, bomber, arrows, skeleton army, and spear goblins. Now that I am in arena 4, I have to wait to get the baby dragon before I can push any higher. If I remember from my early days in the game, arena 4 is when level 8s first come along, and my arrows are like a zap to their minion hoards, doing barely any damage. Lol, just got the valk on my level 3 account. I was at the top of arena 1, and I am now one battle away from arena 4, having lost only 1 battle today.